Previously, on MinerBumping... Agent Bob the Fourth mastered the Solitude region. Inspired by repeated visions of the number 315, Bob purchased 315 million isk worth of gear and set off in search of adventure in other regions. Among the items Bob purchased was a gank Algos. 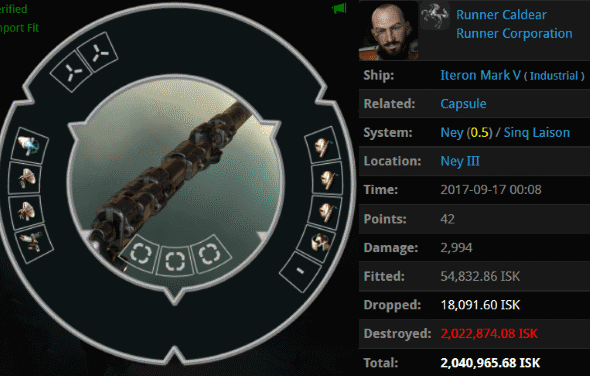 Our hero spotted an oddly fit Iteron Mark V and ganked it, along with its 44 million isk pod. 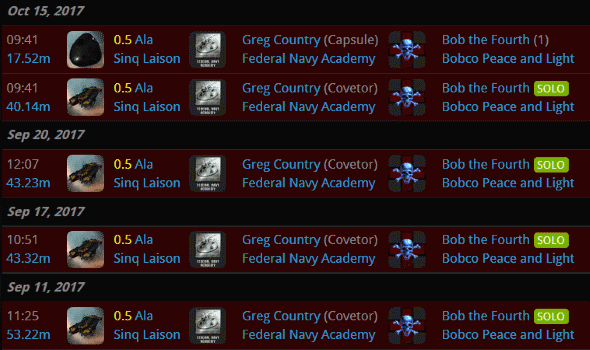 While Bob was reflecting upon his righteous gank and the strangeness of the hauler fit, he found his Algos under attack. A KarmaFleet member named Link Severasse, who was flying alongside another KF member, tried to interfere with the gank. 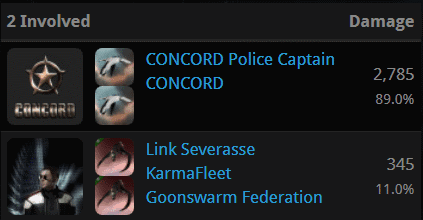 But he only managed to leech on a CONCORD killmail. Bob gave the two KarmaFleet Goons the benefit of the doubt and graced them with a "gf". Clam Basher, the KF member who was too timid to open fire, copped an attitude. Agent Bob was astonished. What are they teaching people in KarmaFleet these days? Clam had been afraid to shoot at Bob, but he preferred to do the talking. For the most part, Link Severasse remained quiet. Perhaps he was embarrassed by his mouthy friend. Despite his earlier reluctance to engage in PvP--even with CONCORD on his side--Clam behaved as though he was eager to fight. Nevertheless, Bob's mission went on according to his own timetable. 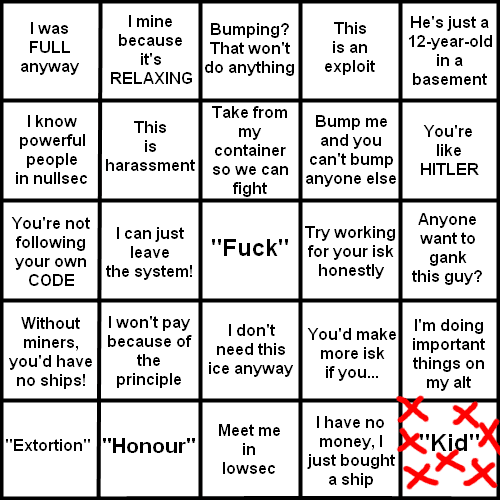 For now, the first priority was to update his Miner Bingo card. Bob cursed his luck. You go for so long needing a particular square and then you get a bunch of them at once. 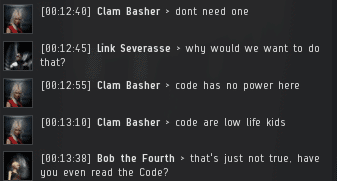 Over half an hour after ganking the fail-fit Iteron Mark V, Bob received a cryptic EVEmail from its pilot. Why was he laughing? Had he deliberately set himself up to be ganked as part of some elaborate plan? Mystery solved: The hauler was an ordinary bot-aspirant. Over the following weeks, Bob got to know the locals well, and they got to know him. Bob got to know some of the locals a little too well. Greg Country was certainly a creature of habit. In the end, Bob triumphed. He knew he would; he had the Code. After his tour through highsec, Bob was more convinced than ever that he was on the right path. As long as he remained true to the Code, there was nothing he couldn't do. And he taught the carebears an important lesson, too: Without the Code, all they could do was die and cry about it. wow antigankers are failing so hard right now. damn they are bad at stopping ganks. Confirmed. They are still failing nonstop daily. I've also noticed some peculiar behavior lately on the behalf of KarmaFleet members. 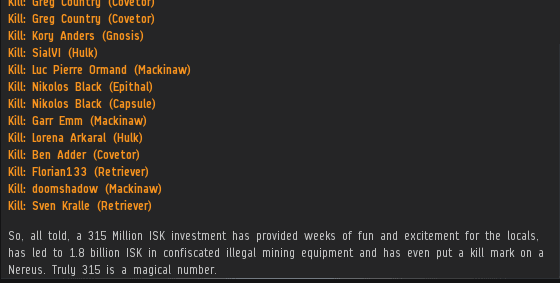 I had to kill one last month for AFK mining in Hageken. Got no "GF" out of him. I know they aren't New Order but we have Agents over there in that corp. They need to get things sorted out. I'd hate for someone to have to make them all buy mining permits in order to preserve their existence. Who fits a paper bag of a ship like that and pumps 2 bill in it? Must be lisanna strusses alt. It was only 2 million. I had to stare at it a while to figure out where the commas were exactly. I stand corrected and actually laughed a little more. It is true, he who loses the least, cries the most. I've heard. I don't have any rockband games, but I like Guitar Hero. This has proven to be a most enjoyable series. Bob was wise to embrace his visions of the number 315, which lead him to unearth a nest of bot-aspirants, and other undesirables. It is disappointing to learn of the existence of an extremist cell within Karma Fleet, who take it upon themselves to question the authority of James 315. 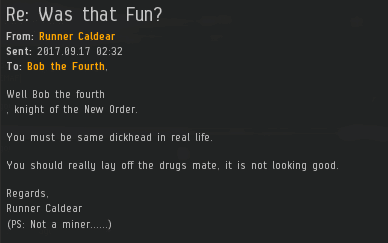 Well it is a new player friendly corp to be fair. Lets face it, its not like NOL had closet miners within it. The license plate said fresh and it had dice in the mirror. That clam basher is an idiot. I wonder if the rest of SNOOO cries as much as that idiot. But I thought 'Nah, forget it' - 'Yo, homes to Bel Air'. And I yelled to the cabbie 'Yo homes smell ya later'. To sit on my throne as the Prince of Bel Air. As a KF recruiter (who has appeared on these sacred pages before defending the CODE) I can only apologise for the behaviour of these KF members. Rest assured that they are being investigated: because if someone doesn't respect the CODE, chances are they don't respect other sensible sets of rules designed to make the game better for everyone. That was fun, thank you! Happy endings like this put a smile on my face. Praise James! Anti-gankers only do it to hide their latent homosexuality. Everyone knows they're all gay pedophiles like Kevin Spacey. It's an open secret.